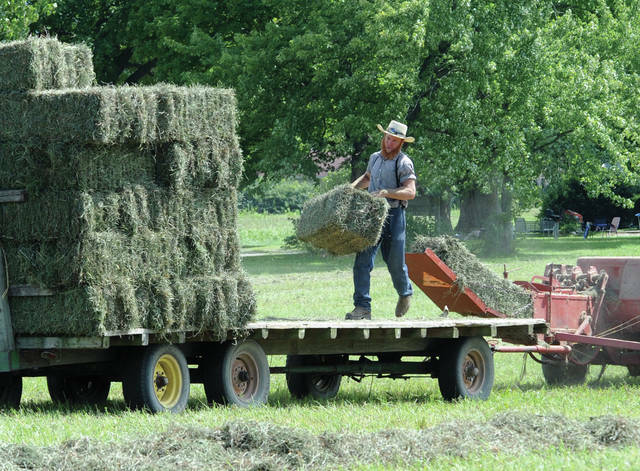 Mike Ullery | Daily Call Neil Garber of Troy stacks baled hay on a wagon in a field off Lytle Road on Wednesday. The third cutting of the season was cut in the morning and baled in the afternoon, in spite of temperature near 90 degrees, in an effort to beat rain forecast for the next several days. Mike Ullery | Daily Call Neil Garber of Troy bales hay on a wagon in a field off Lytle Road on Wednesday. The third cutting of the season was cut in the morning and baled in the afternoon, in spite of temperature near 90 degrees, in an effort to beat rain forecast for the next several days. Neil Garber of Troy stacks baled hay on a wagon in a field off Lytle Road on Wednesday. The third cutting of the season was cut in the morning and baled in the afternoon, in spite of temperature near 90 degrees, in an effort to beat rain forecast for the next several days. Neil Garber of Troy bales hay on a wagon in a field off Lytle Road on Wednesday. The third cutting of the season was cut in the morning and baled in the afternoon, in spite of temperature near 90 degrees, in an effort to beat rain forecast for the next several days. https://www.dailycall.com/wp-content/uploads/sites/30/2018/09/web1_090518mju_haybale1.jpgMike Ullery | Daily Call Neil Garber of Troy stacks baled hay on a wagon in a field off Lytle Road on Wednesday. The third cutting of the season was cut in the morning and baled in the afternoon, in spite of temperature near 90 degrees, in an effort to beat rain forecast for the next several days. https://www.dailycall.com/wp-content/uploads/sites/30/2018/09/web1_090518mju_haybale2.jpgMike Ullery | Daily Call Neil Garber of Troy bales hay on a wagon in a field off Lytle Road on Wednesday. 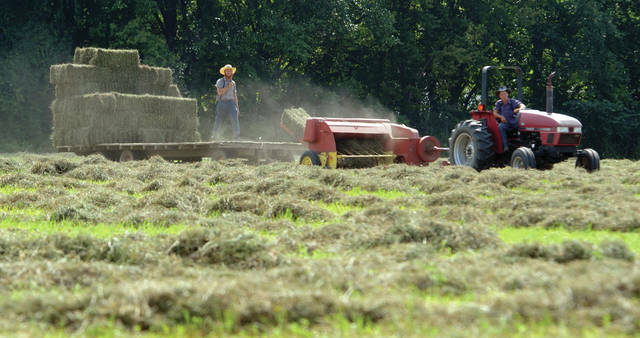 The third cutting of the season was cut in the morning and baled in the afternoon, in spite of temperature near 90 degrees, in an effort to beat rain forecast for the next several days.